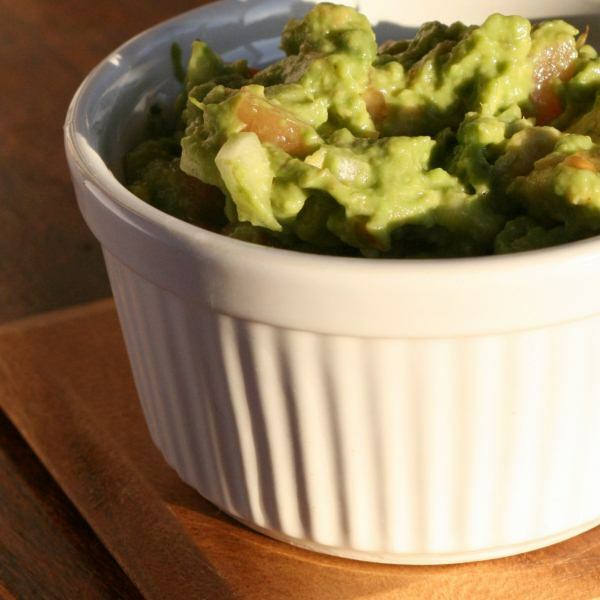 Guacamole is a dish that doesn’t lend itself to two things – mass production and sitting around. Avocado deteriorates at an astonishingly fast rate, so commercial guacamole has to be packed full of mysterious additions to stop it discolouring. After a couple of hours exposure to the air, an avocado’s natural colour is a kind of light grey. Not very appetising. If you make guacamole yourself, the lemon will help to stave off the discolouring for a while, but a vibrant guacamole will soon start to look a little sad and forlorn. Making guacamole fresh and eating it quickly is the only option. Scoop the flesh out of a couple of large, very ripe avocados. Be sure to take as much of the dark green flesh closest to the skin as you can. It’s this part that will give the guacamole it’s colour. Mash the avocado with a fork. Don’t pulverise the fruit. Leave it chunky. Finely chop a small onion – a normal white onion will do, but a red one is better – and a medium tomato, and add both to the avocado. Season with salt, pepper and cayenne pepper, and squeeze in the juice of half a lemon or a whole lime. Mix well and adjust the seasonings, chilli and lemon or lime until you hit the right spot.